Kristin J. Achterhof is the national co-chair of Katten's Intellectual Property Litigation practice, as well as the national co-chair of the firm's Advertising, Marketing and Promotions practice. Kristin also serves as Katten's national hiring partner. She concentrates her practice in the area of intellectual property litigation and counseling. In addition to representing clients as a first-chair trial attorney in matters pending in federal and state courts across the country and before the US Patent and Trademark Office Trademark Trial and Appeal Board, Kristin provides strategic counseling to clients on a wide variety of complex intellectual property and unfair competition matters, including the prosecution and defense of claims involving copyright, trademark, trade dress and patent infringement, defamation, trade secret misappropriation, false advertising, and right of personality. Kristin has been acknowledged for her "inspirational courtroom performances," and as a "contentious ace" who is a "trusted adviser of several tech titans" (World Trademark Review 1000 – The World's Leading Trademark Professionals). Kristin has represented multinational clients in high-profile cases, including in the application of intellectual property laws to the Internet and e-commerce. She also counsels clients regarding novel and "cutting-edge" issues regarding the protection of intellectual property rights in computer software and emerging technologies, as well as the exploitation of copyrights and trademarks over the Internet and in social media. Kristin has represented a full range of clients, including Universal Studios, Inc.; Universal Music Group; Times Mirror, Inc.; Home Box Office, Inc. (HBO); Fruit of the Loom, Inc.; Microsoft Corporation; Allstate Insurance Co.; Planet Hollywood, Inc.; Sears, Roebuck and Co.; Bausch & Lomb; Atkins Nutritionals, Inc.; Arcadia Group International; Zango, Inc.; General Media, Inc.; USA Cable Entertainment, LLC; AIG Technical Services, Inc.; the Recording Industry Association of America, Inc.; the Motion Picture Association of America; Sony Music Corporation; Motorola Mobility LLC; Lenovo; and Kimberly-Clark. In addition to her extensive litigation experience, Kristin also represents clients in licensing, acquisition, distribution and vendor transactions involving clients' intellectual property rights, and counsels clients on the development, protection and licensing of proprietary technologies. Kristin also counsels clients on advertising-related matters; the protection of copyrights; the clearance, policing and registration of trademarks; the identification and protection of trade secrets; and the enforcement of license, confidentiality and non-competition agreements. She is a member of the Panel of Neutrals for the Alternative Dispute Resolution Program, sponsored jointly by the International Trademark Association and the International Institute for Conflict Prevention and Resolution, and serves as panel counsel for intellectual property and technology cases for AIG Risk Management, Inc.
Kristin is a frequent speaker and panel member for business, legal practice and educational groups across the country and is frequently quoted and mentioned in national and international publications, including The National Law Journal, The Wall Street Journal, The New York Times, Chicago Tribune, Reuters News Service, "Fox News," IP Law & Business, Tech News World, Law.com, Birmingham Post and The Recorder, as a legal authority in copyright and trademark matters. She has spoken before appellate judges from across the country regarding "Trademark Infringement and Dilution Under the Lanham Act and State Common Law" and participated in a panel presentation regarding "Intellectual Property Issues Confronting the Courts" at the American Bar Association's Appellate Judges Summit. She has served as a faculty member for the International Trademark Association's (INTA) Intellectual Property Trial Academy and as a guest lecturer at Northwestern University School of Law, DePaul University College of Law and Chicago-Kent College of Law. 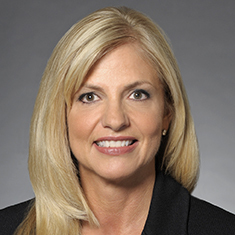 Kristin has been repeatedly named among the IP Stars for Illinois in Managing Intellectual Property's IP Handbook, and she has been twice named to Managing Intellectual Property's "IP Stars - Top 250 Women in IP". In addition, she repeatedly has been identified as a top attorney in her field byWorld Trademark Review, The Legal 500, and Super Lawyers.